Visual Studio 2017 15.4 Preview 1 is now available for download. The latest update brings bug fixes and performance improvements. The new version brings many new updates to the tools for Universal Windows Platform development. The new preview version of Visual Studio also includes support for the Windows Fall Creators Update SDK preview. Visual Studio 2017 version 15.4 Preview 1 brings first class support for developers targeting the Windows Fall Creators Update SDK preview. To install the latest Windows Fall Creators Update SDK preview, you need to become a Windows Insider. Insiders can install the SDK previews here. The Windows Fall Creators Update brings support for .NET Standard 2.0 to UWP development. In order to leverage the new APIs with .NET Standard 2.0, you need to set the minimum version target of your application to the Windows Fall Creators Update SDK preview. You will then have the ability to reference .NET Standard 2.0 NuGet packages, class libraries, and APIs directly from your UWP application. Visual Studio 2017 version 15.4 Preview brings in new project templates to help you package any Windows projects into an .appx container – allowing for modern distribution or submission to the Windows Store. To get started with the Windows Application Packaging Project, go to File -> New -> Project… and select the new “Windows Application Packaging Project” template under the Visual C# -> Windows Universal node. You can now edit or remove XAML resources with XAML Edit & Continue. In addition, you can also add ControlTemplates. To leverage these new features, make sure you are running the Windows Fall Creators Update SDK preview. Xamarin Live enables developers to continuously deploy, test, and debug their apps, directly on iOS and Android devices. After downloading the Xamarin Live Player – available in the App Store or on Google Play – you can pair your device with Visual Studio and revolutionize the way you build mobile apps. This functionality is now included in Visual Studio and can be enabled by going to Tools > Options > Xamarin > Other > Enable Xamarin Live Player. Individual package install and download issues will be displayed at the end of install with links to the Developer Community to get more help so that you can address issues that may be affecting your computer’s ability to install Visual Studio in its entirety. We have added the popular Productivity Power Tools navigation feature “Control Click Go To Definition” to the core Visual Studio product. For languages which support it (currently C#, VB and Python, with more languages coming in future releases), holding down the Ctrl key will allow you to click on a symbol in the Visual Studio editor and navigate to its definition. If you prefer to keep the older Ctrl+Click word selection behavior, you can control the feature’s key usage via Tools > Options > Text Editor > General > “Enable mouse click to perform Go To Definition”, which lets you select other modifier keys or turn off the feature if you wish. Added support for Linux with CMake. For more information. Improved support for the Experimental .NET 4.6 option in Unity 2017.1. Add support for the Set Instruction Pointer feature under the new runtime. Support for user defined assemblies (assembly.json) in Unity 2017.2. General improvements in Expression Evaluation while debugging. The Android SDK is now being installed to a private location under %programdata%. This will allow users to manage their shared SDK installation elsewhere without affecting any VS-TACO scenarios. The XAML Designer is disabled for UWP projects with a min version target of the Fall Creators Update SDK Preview. Workaround – Set your minimum version to the Creators Update SDK (10.0.15063.0). If you want to use .NET Standard 2.0 with UWP development, there is currently no workaround to this issue. The Windows Application Packaging Project defaults the minimum version target to the Windows 10 November Update (10.0.15086.0) which is not valid for Desktop Bridge applications. Workaround: – Go to the project properties for the packaging project and set the min version to 10.0.14393.0 or higher. If you directly or indirectly use types in the System.Security.Principal namespace or those methods on the System.Diagnostics.Process class that query active processes, they may throw TypeLoadException when compiled with the .NET Native compiler. Workaround: – Do not use the .NET Native compiler, or avoid using the API’s in this preview. Programmatic file IO access using System.IO APIs to brokered locations (such as the documents and pictures folders) will fail with access denied when running a UWP application. Workaround: – Use WinRT file IO APIs (Windows.Storage.*). Add a project reference from a UWP project (with a min version of the Windows Fall Creators Update SDK preview) to a .NET Standard 2.0 class library results in the UWP project failing to build with: Project ‘[ClassLibrary].csproj’ targets ‘.NETStandard,Version=v2.0’. It cannot be referenced by a project that targets ‘UAP,Version=v10.0.[Version]’. Workaround: – Install the preview version of the .NET Core 2.0.2 SDK. Install the x86 version here. Install the x64 version here. Type universe cannot resolve assembly: Microsoft.Win32.Registry, Version=0.0.0.0, Culture=neutral, PublicKeyToken=b03f5f7f11d50a3a. Cannot resolve Assembly or Windows Metadata file ‘Microsoft.Win32.Registry.dll’. 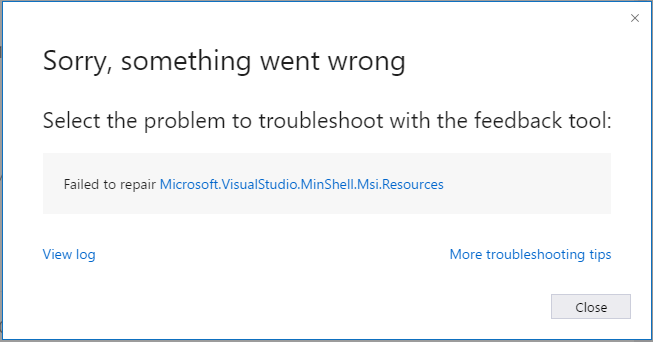 Workaround: – Restart Visual Studio 2017 and reopen the project. Inheritance security rules violated by type: ‘System.Net.Http.WebRequestHandler’. Derived types must either match the security accessibility of the base type or be less accessible. Workaround: – Remove the R Language Support component, or install Visual Studio 2017 Update 3 alongside Update 4 Preview and sign in using 15.3, which will also sign you into 15.4 Preview. You can download latest Visual Studio 2017 15.4 Preview 1 from the official link below.